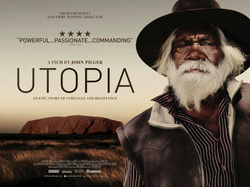 Over January and February the Nyoongar Tent Embassy and the Green Left Weekly have teamed up to present a series of FREE screenings of John Pilger's latest film:UTOPIA. "A new John Pilger film about Australia, Utopia, commissioned by ITV and backed by the UK company, Network Distributing, and produced by Dartmouth Films, will be released in UK cinemas on 15 November 2013. The launch of the film in Australia will consist of special screenings at the Museum of Contemporary Art (MCA) in Sydney, leading up to 'Australia Day' on 26 January 2014, followed by a cinema release. Utopia is produced by Dartmouth Films and released in association with Network Releasing. The cinema release is Friday 15 November 2013. ITV will broadcast Utopia in December 2013. A DVD with an extraordinary collection of interviews and sequences not included in the final cut of the film will be released by Network at the same time. In an article for the Guardian, John Pilger gives a taste of the latest film about Australia, his homeland - the first was The Secret Country, broadcast in 1985."